French painter, etcher, lithographer, and sculptor. 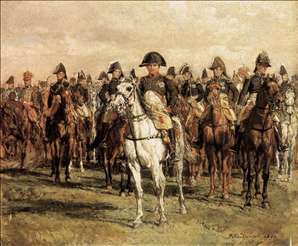 He was immense1y successful with his trite and nigglingly detailed historical paintings and historical genre pieces (particularly scenes from the Napoleonic campaigns) and from the 1840s received the highest official honours, including the Grand Cross of the Legion of Honour - he was the first painter to win this award. Astonishingly conceited as well as mean-spirited, he cultivated a huge white beard and liked to be photographed or painted in attitudes of fiercely profound thought, as in his self-portrait of 1889 in the Muse d Orsay. He had a personal enmity for Courbet and may have been instrumental in inducing the government to impose a fine on him after the suppression of the Commune. Meissonier did his best work when he was at his least pretentious. His landscapes are attractive descriptive exercises and his Rue de la Martellerie (Muse d Orsay, Paris, 1848), which shows a corpse-strewn street during the revolutionary events of 1848, has genuine pathos and impressed Delacroix. There are large collections of Meissonier s work in the Muse d Orsay and in the Wallace Collection, London. See more details about "Napoleon and his Staff"